"When is a Man a Mason"
M -When he can look out over the rivers, the hills, and the far horizon with a profound sense of his own littleness in the vast scheme of things, and yet have faith, hope and courage--which is the root of every virtue. A -When he knows tat down in his heart every man is as noble as himself, and seeks to know, to forgive, and to love his fellowmen. S -When he knows how to sympathize with men in their sorrows, yea, even in their sins--knowing that each man fights a hard fight against many odds. T -When he has learned how to make friends and to keep them, and above all how to keep friends with himself. E -When he loves flowers, can hunt the birds without a gun, and feels the thrill of an old forgotten joy when he hears the laugh of a little child. R -When he can be happy and high minded amid the meaner drudgeries of life. : When star-crowned trees, and the glint of sunlight on flowing waters, subdue him like the thought of one much loved and long dead. M -When no voice of distress reaches his ears in vain, and no hand seeks his aid without response. A -When he finds good in every faith that helps any man to lay hold of divine things and sees majestic meanings in life, whatever the name of that faith may be. S -When he can look into a wayside puddle and see something beyond sin. O -When he knows how to pray how to love how to hope. N -When he has kept faith with himself, with his fellowman, with his God; in his hand a sword for evil, in his heart a bit of song--glad to live, but not afraid to die! 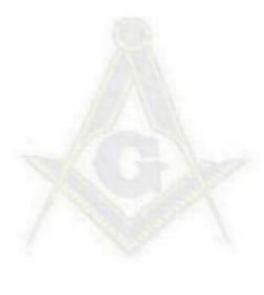 Such a man has found the only real secret of Masonry, and the one which it is trying to give all the world."